What’s new for SG 4D? SG 4D version 2 was released with tons of changes. It is a very exciting release, a big overhaul, and with lots of new features. In this post, I will highlight the significant changes for end-users. In the next post, I will talk about the changes from a technical perspective, which would include the new technologies that were used – CoreData, In-app-purchase, Facebook integration, etc..
How did we come thus far? 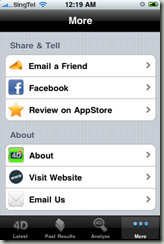 Before we start with the changes in the app, let’s look at a short history of the app. 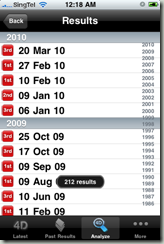 Oct 2008: SG 4D was first released, and it became the Top 100 apps instantly. Jul 2009: A minor bug fix, and it was also the last update for version 1. 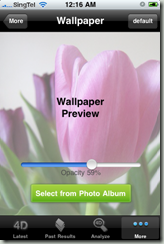 Nov 2009: SG 4D for Android was released. 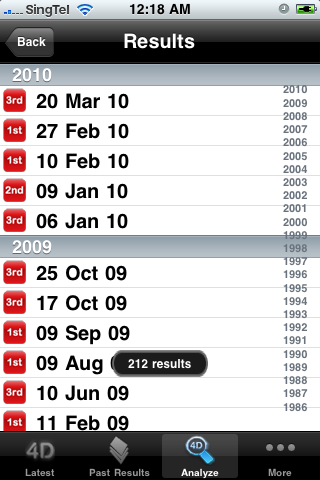 Jan 2010: SG 4D was squeezed out of Top 100. This is mainly due to a new and better 4D app arriving in App Store. It is interesting to note a few things about the history. There was very little update for SG 4D, and when there are updates, it is usually minor changes and bug fixes..
SG 4D dominated and remained as the only 4D app until 2 months ago, when SG Live 4D was released. SG Live 4D provided a very fun feature – live broadcast at 6.33pm! This is a huge competitive edge, and consumers choose SG Live 4D over SG 4D since then. But note that SG 4D version 2 was not released because it lost the competitive edge, though that is a huge motivating factor. 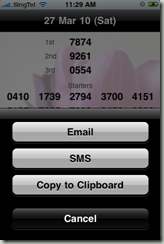 SG 4D version 2 for iPhone was planned to release after SG 4D for Android, which includes a major overhaul. You would see why later. The first improvement is to make the retrieval of the 4D results faster. 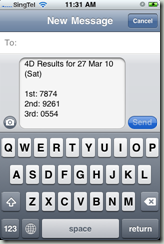 In version 1, 4D results were retrieved from Singapore Pools server. That way was sometime slow due to the server having a high load, and also because the retrieval process was not optimized. In version 2, all the 4D results were retrieved via Google’s cloud infrastructure. This makes retrieval not only faster, but also more stable. And similarly, SG 4D for Android retrieves results with the same architecture. Users can now email or SMS a result of a particular day, informing friends of a result, or telling them they have strike lottery! 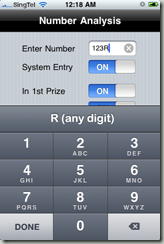 In fact, users can copy the result, and paste it in any apps eg. Facebook or twitter. The app is now more friendly with VoiceOver turned on. 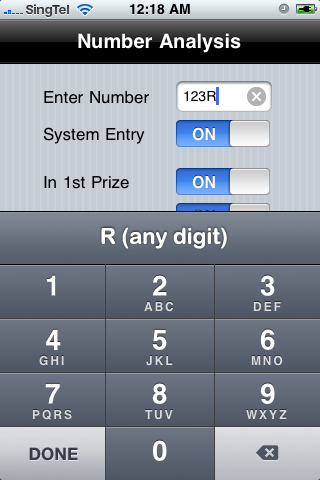 The numbers are read out digit after digit with a slightly longer pause eg. 1-2-3-4. 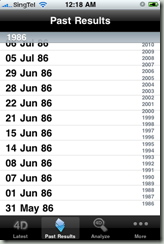 In version 2, we have made available 24 years of past results since May 1986 (when betting was computerized). Disclaimer: You need to unlock the Premium Features ($3.99) to get 24 years of results. Without unlocking, only 3 years of results are available. Even better, we have made checking of the past results possible in offline mode! No longer do you need Internet to dig up a past result. You can filter different prize category: Interested in 1st, 2nd, 3rd, starter or consolation? In version 1, there is always an ad banner at the bottom of the screen. Though no one has complained or requested for a ad-free version, we have made it possible to remove it. 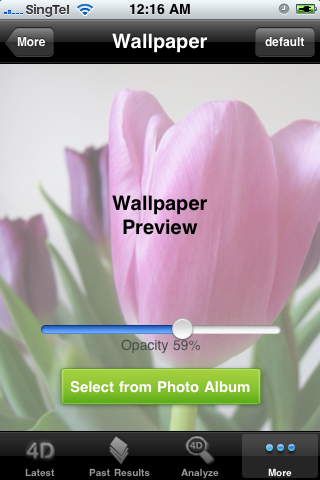 In version 2, users may purchase and unlock Premium Features ($3.99) to remove the ad, and including other goodies. There are a lot more things that we plan to put in the app to make 4D more fun. In future releases, you should find new features under More. 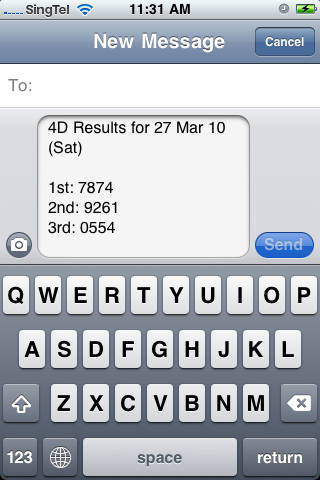 For now, we would hope you can share with your friends and families SG 4D for iPhone, and also for any other phones.